Many people mistakenly use the terms “diamond shape” and “diamond cut” interchangeably but there is a difference between them. The cut of a diamond refers to how the artisan maximizes the features of the gemstone by creating angles and details, making the light go into the diamond and bounce back in the most brilliant way possible. The quality of a diamond's cut contributes greatly to the overall value of the gemstone, whereas the shape of a diamond does not increase or decrease a diamond's value. When discussing diamond shapes, you are referring to the actual geometric shape of the diamond, whether it is round or oval, emerald or heart-shaped, for example. With all the possibilities of diamond shapes, how do you go about choosing one? If you are buying yourself a diamond, it's just a matter of looking at all the different varieties and finding one that is most pleasing to your eyes and look best as a diamond ring or diamond pendant. When choosing a diamond shape for someone else, it becomes a bit more difficult. For an engagement ring, many women prefer the traditional round-shaped diamond, while others may enjoy having something more unique. A young woman or one who is considered a hopeless romantic may prefer to have a heart-shaped diamond. Other considerations for selecting diamond shapes for rings should be based on the size of a woman's hand. Some things to consider are if she has long, slender fingers, can elegantly wear a pear-shaped diamond, marquis, or oval shape. Place the same shaped diamond rings on a woman with shorter, wider fingers and it will cover up too much of the finger and look bulky and perhaps even awkward. Small hands typically look best with round-shaped or princess-shaped diamonds. Even though there is a wide variety of diamond shapes available, the most commonly purchased diamond shape for engagement rings is the round diamond. Round diamonds are considered the “classic engagement ring” and the stones are often set in yellow gold or platinum. 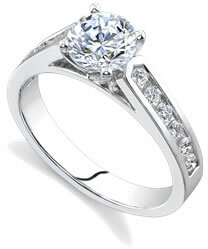 In fact, any diamond shape other than round is considered to be a “fancy” shape since the round diamond is so popular.